66 Satellites can only mean one thing – RELIABILITY. Iridium is “the only truly global mobile communications network” as it has the most satellites in orbit out of all the other satellite networks. Signal is available everywhere on planet earth as long as you have direct line of sight to the sky and no interference in the surrounding areas. The Iridium 9555 satellite phone is built tough and rugged and can handle almost any environment. This satphone is smaller than the older first generation types of satellite phones. The Iridium 9555 fits comfortably in your hand and is quite light. The antenna is also very thin and sleek and is internally stored when not in use. lifeline to the outside world. When normal phone lines or mobile networks go down due to disasters or government interventions, this satellite phone will keep working. These satphones are used by the world toughest customers such as the United States of America Army. 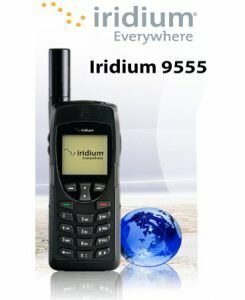 The Iridium 9555 satellite phone is as easy to use as a mobile phone. The phone can also send and receive SMS messages and does data at speeds of up to 9KBps for email and basic Internet use. A bonus feature is the ability to SMS an Iridium satellite phone for FREE via our website. The Iridium 9555 is a must have for those who need to communicate anywhere anytime .